With over 33,500 copies sold of the previous edition, the winning formula of this incredibly successful book will remain the same. From SWOT analysis and core competencies to risk reward analysis and the innovation circle, Key Management Models explains each model in a clear, structured and practical way. The PERFECT reference book, no matter what business youre in. 1 Ansoffs product market grid. 4 Competitive analysis: Porters five forces. 14 Strategic human capital planning. 18 The value disciplines of Treacy and Wierseman. 21 Beer and Nohria - E and O theories. 24 Competing values of organisational effectiveness. 26 Coveys seven habits of highly effective people. 32 House of purchasing and supply. 34 Kotlers 4Ps of marketing. 35 Kotters eight phases of change. 37 Lean thinking / just-in-time. 44 Senge  The fifth discipline. 47 The theory of constraints. 57 Root cause analysis / Pareto analysis. 58 The six thinking hats of De Bono. Appendix: Model Matrix / Categorisation of models. 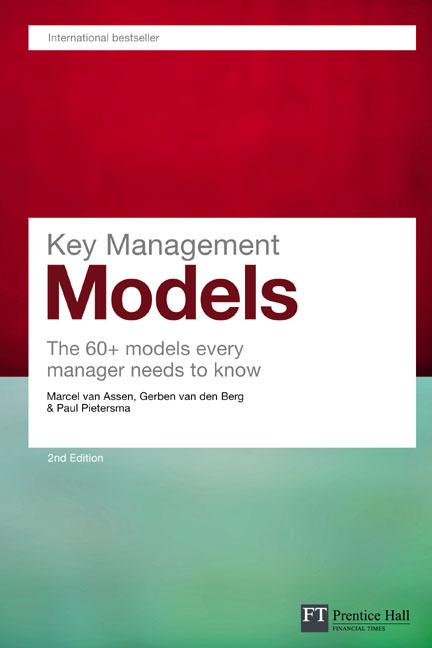 Marcel van Assen(1969) is a senior consultant at the Operations Management group of Berenschot. His industrial consulting experience covers various manufacturing, supply chain, and strategic issues, from operational excellence, outsourcing & contract manufacturing to value-innovation based on strategic conversation, roadmapping and foresight. In addition, he is an assistant professor of manufacturing management at the Department of Management of Technology and Innovation Department of RSM Erasmus University he is (co)author of several books and articles on operations and innovation management. He holds an MSc. in mechanical engineering from the University of Twente, an MSc. in business administration (strategy and organisation) from the Open University, and a Ph.D. in business administration froe member of ERIM (Erasmus acturing firms, clusters and networks. Gerben van de Bergread business administration at the University of Groningen. He works at Berenschot as consultant in the Business Strategies group. He is a co-author of the book Excellence = optimization and innovation and (co)author of several articles concerning strategic management. Paul PietersmaMSc. BA is a strategy consultant and managing director of Business Strategies at Berenschot. He has more than 10 years of experience in the consultancy business in which he advised many CEOs and boards of directors on various strategic issues. He has won the Dutch Professionals Award of Management Consultancy, he has published several articles on strategy and he is the (co)author of two leading Dutch strategy books Het Strategieboek I and Het Strategieboek II. Clears all concepts. Easy to understand. Nice illustrations of examples.